In late May, members of the Advanced Scientific Computing Advisory Committee Scientific and Technical Information (ASCAC-STI) subcommittee, which includes Kerstin Kleese van Dam, the Data Services Team Lead within PNNL’s Advanced Computing, Mathematics, and Data Division, visited the Office of Scientific and Technical Information, known as OSTI, in Oak Ridge, Tenn. Their visit was in direct response to a charge from Office of Advanced Scientific Computing Research Associate Director Dr. Steve Binkley. The subcommittee’s goal was to review and appraise the current methods OSTI uses to disseminate information broadly, including employing web-based tools and technologies, as well as evaluate OSTI’s future service plans. The Advanced Scientific Computing Advisory Committee Scientific and Technical Information subcommittee made a special trip to Oak Ridge, Tenn., to review OSTI’s current and future service provisions. 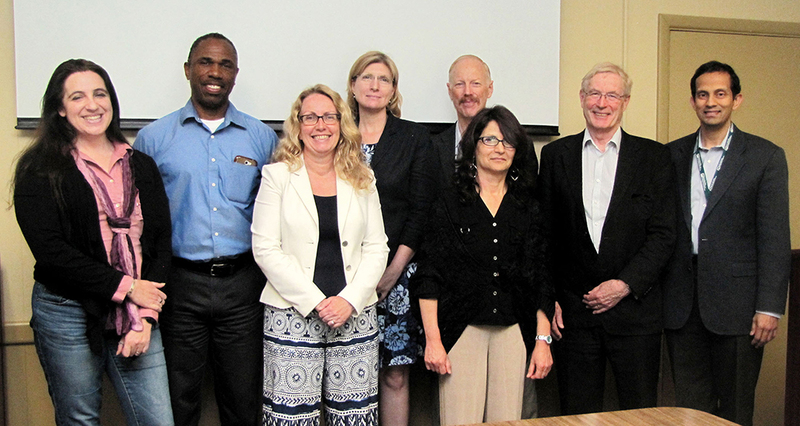 (L to R): Tina Cartaro (SLAC), Dean Williams (LLNL), Kerstin Kleese van Dam (PNNL), Christine Chalk (DOE ASCR), Richard Luce (University of Oklahoma), Silvia Crivelli (LBNL), Tony Hey (University of Washington), and Mallikarjun Shankar (ORNL). Enlarge Image. OSTI maintains publicly available collections of scientific and technical information on behalf of the U.S. Department of Energy and DOE’s Office of Science. Because of new guidance, OSTI’s role is set to expand in the next few years as it will be providing free open access to all DOE publications one year after publication. In addition, OSTI will continue to disseminate other STI products, such as patents, multimedia, and software, and create data citations for DOE scientific data sets on request.